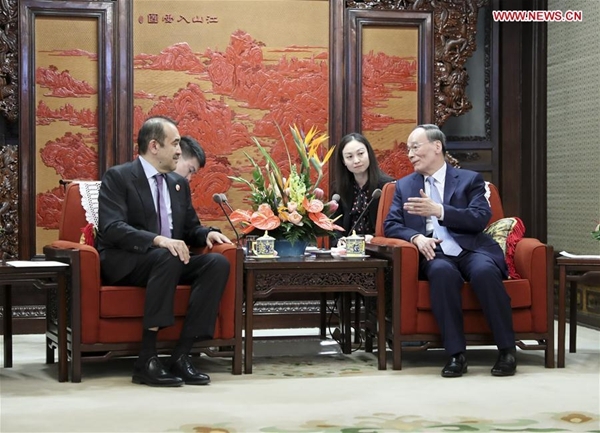 Description：Chinese Vice President Wang Qishan met with Chairman of the National Security Committee of Kazakhstan Karim Masimov Monday in Beijing. Wang said China and Kazakhstan are good neighbors and partners, and have maintained close, high-level exchanges and solid political mutual trust thanks to the strategic guidance and leadership of Chinese President Xi Jinping and the first President of Kazakhstan Nursultan Nazarbayev. The two countries have achieved fruitful results in the joint construction of the Belt and Road and in other fields. Their coordination on international affairs has been highly efficient and close, and they have firmly supported each other on issues concerning their core interests, Wang said. The new President Kassym-Jomart Tokayev has been an old friend and good friend of the Chinese people, said Wang, adding that he believes the China-Kazakhstan comprehensive strategic partnership will continue to maintain a vigorous development momentum under the guidance of the two heads of state, to benefit the two countries and the two peoples. Masimov said Kazakhstan and China are good neighbors and strategic partners. Developing ties with China is a priority of Kazakhstan's foreign policy. He said Kazakhstan is willing to work with China to promote the construction of the Belt and Road and constantly push bilateral ties forward.